Two people sailing - Where should the mast go?? Thread: Two people sailing - Where should the mast go?? I've had great fun with my silly sailing rig, but the time has now come for something a bit more powerful ! I've got hold of an old mirror mainsail, which I'm going to cut down to make either a standing or balanced lugsail. I'm really struggling to know where to put the mast though. This is fine solo, but the thwart cuts into the bow paddler's back if you leave it in place for tandem use. I'm happy to lose the front seat *whilst* sailing (we can share the kneeling thwart and back seat if we have to), but really need it to be operational when in paddling mode (the boat is an asymmetric, so cannot really be paddled or sailed backwards). 1) move the mast thwart back a bit so it doesn't annoy the bow paddler, and fit a mast foot below it to hold the base of the mast. JHB0510 - hope you don't mind, but I've stolen your photo to illustrate this!! We go behind the bow seat and always have. 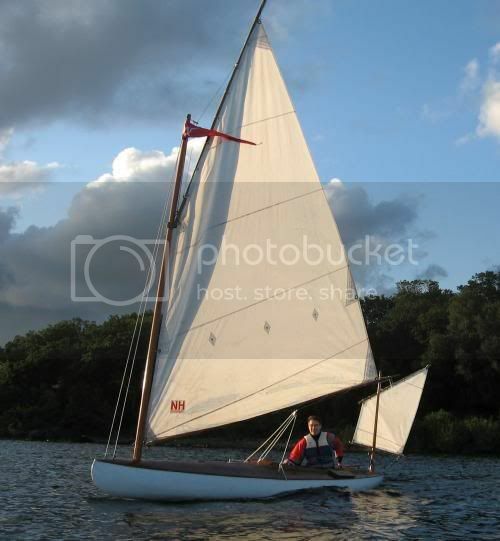 However, I have often wondered about putting it forward, after all sailing boats have the mast well forward. Where will your lee board need to be in the 2 options? There are ways to get round the dig in the back syndrome. You have spotted the obvious one. The other alternative is to make a curved thwart. This uses the same holes in the gunwales and looks quite good too. We are using a Solway Dory Exped rig and this is troublesome to the bow paddler because the sail / sprit pole? is partly forward of the mast. It would be much better forward, and might get moved there yet. if everything is behind the mast then this will not be an issue. We are looking at the Solway Dory system which uses 2 sails, one at each end, but it could be complicated for non sailors like us. I was thinking that with this system the lee board might work of the central yoke, thus negating the need for a lee board thwart. Trouble is, I imagine the only way to know for sure is to go ahead and try. If it don't work then you are left with holes and mast feet in the wrong places. The optimum place for a sale is in the middle of a boat - look at most yatchs and so on. This way the boat can pivot around the sail. By putting it at the front - or back, then the wind will always want to turn the sail (and thus the end to where it is attached) away from the direction of the wind. I appreciate that canoes were not designed to sail but a sail on a canoe in the middle can be sailed across wind whilst one with a sail at the front won't. (all other things being equal). Whilst this might be a bit academic its worth thinking about. Come on BT!! If you race RSs you must have some idea of CoE and CoLR (where the sail pushes and where the water pushes back )!!! CoE of the sail, probably about 18" behind the mast, should be level with your leeboard, or if not using one, around the centre / slightly aft of centre.... possibly. Once you have decided, give me a shout for the Sikaflex. So why do all (many) small sailing boats have the mast so far forward then? Because as Chrish (above) points out there are many other factors which can also influence the position of the sail; including where the people are to sit, where the centre board is, the position of the rudder,the hull design and shape and not the least the design shape of the sail, the type of rig and so on. Unless you have a very big sail, mounting it near the bow will probably result in the centre if effort being well forward of the centre of the boat. Our sail is about as big as I would like to use on a canoe, and stepped behind the front seat it is pretty well balanced with the leeboard mounted on the yolk. Having the mast mounted at the front might not leave much space for the bow paddler to avoid the boom and kicking strap. Another consideration is the stiffness of the hull cross section. It might well be stiffer near the bow where it is narrower. Our Penobscot flexes quite a lot withe the mast stepped behind the seat, and i will probably havwe to add diagonal bracing. If anything I think the penobscot is probably stiffer than the aurora. I don't think I've answered your question, but that's my thoughts anyway! Yeah, of course I know all the theory, and have even done a bit of canoe sailing before...... but this is about compromise (in theory I'd like an 18 foot canoe for sailing, then I wouldn't have this dilemma!). I also know that the more you think about this one, the more complicated it gets. I also know I'll only get one shot at this without making a big mess of my boat! So, surely someone must have tried this already, and knows what actually works!? Bow mounted would be stronger, lighter, and out of the way. 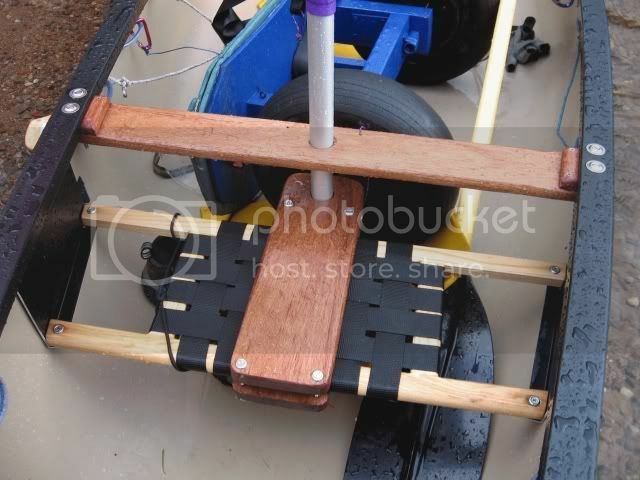 The major problem seems to be lee-helm, and having the leeboard mounted about level with the front seat. For this reason, I'll probably end up mounting it behind the bow seat, particularly given TB's excellent suggestion of a curved thwart. This would put the leeboard a bit in front of the centre thwart, which seems better somehow. I still doubt that the bow seat would be useable whilst sailing though. The Banker often sits on the floor or kit bag facing backwards when we sail, tucked up in the bow. She says it is so she can keep an eye on me because I haven't a clue what I'm doing with the rudder and bits of string. And she's right. The Banker often sits on the floor or kit bag facing backwards when we sail, tucked up in the bow. Another great idea Tenboats - I never thought of facing backwards. So, aft of the front seat it is then! She says it is so she can keep an eye on me because I haven't a clue what I'm doing with the rudder and bits of string. And she's right. Ah yes, I had promised to take you and Grooveski sailing this year to show you the ropes (or a few more of them at least). Doesn't time fly!? If you're still interested, maybe we could fix something up during October? I have experience of sailing canoes with the rigs in various different positions, I've tried to include a summary of the options below. Single mast thwart 32" from bow: Good for downwind sailing, doesn't work well for upwind sailing, even if you line the lee board up properly with the sails CE. 2 mast thwarts 32" from bow and stern: Best option for a multipurpose boat because it keeps the mast thwarts out the way. Sailing with a two masted (ketch) rig is a bit more complicated though (NB James' canoe in the photo has this option, there is a third mast thwart in the stern). Single mast thwart behind the front seat: This option was popular with the OCSG 15 years ago, until we discovered that it was much slower than newer configurations. Putting the passenger in front of the mast is also quite a wet option for the passenger, and not great in waves where it encourages the nose to bury. It does work though and is worth considering, particularly in longer canoes. Single mast thwart, one third of the way down the boat: The fastest and most seaworthy option. 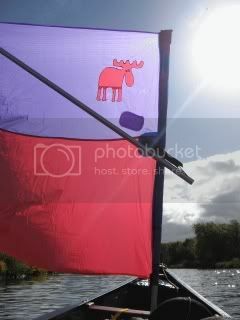 In a typical canoe (with a typical rig) using this position will involve placing the mast thwart in the position traditionally occupied by the front seat, and the leeboard 20" behind the mast. 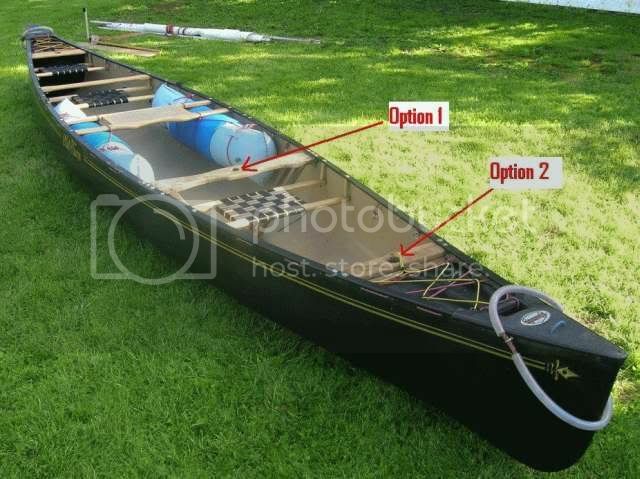 This may not leave much room for a passenger, unless you use a fibreglass sailing canoe which has been specially reinforced so the leeboard thwart can be dispensed with. Last edited by Oceanic; 5th-October-2007 at 07:00 PM. This Thread on WBF is well worth the trouble of reading. Will it work if we start at the yoke and fit the lee board to that, then put the mast 20" in front of the yoke? This would mean no extra lee board thwart, and in bigger boats would put the mast well behind the front seat. On reflection 'much slower' is perhaps an exaggeration, a bit slower would be more accurate. Last edited by Oceanic; 7th-October-2007 at 07:14 PM.